KIRK AND SWEENEY was a wooden schooner, best known for smuggling rum from the Caribbean to the Northeast during the early years of Prohibition. This “schooner” is now bringing 3 incredible rums to our shop. 12, 18 and 23 year barrel-aged editions. Aroma: The aroma presents subtle notes of dried fruits and sweet, toasted breads, along with a base toffee, fresh honey and caramelized sugar. You can also appreciate a faint hint of almonds and vanilla. Taste: Having spent 23 years in the barrel, this rum is as pleasantly complex as the nose and aging would suggest, offering a rich evolution on the mouth–from fresh, sweet sensations to dried fruits. Finish: Finishing off each decadent sip, you’ll find endnotes that range from a distinct caramel, to sherry, to a well-balanced blend of almond and vanilla. 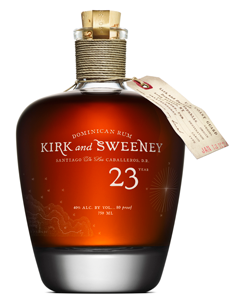 Kirk and Sweeney was distilled using traditionally harvested sugar cane and aged in oak for 18 years to fully develop its profile—an enticing scent of sherry and molasses, followed by the taste of deep vanilla with a hint of caramel and dried fruits. Aroma: This full-bodied rum delivers an intriguing range of aromas, from intense vanillas to faint notes of sherry and raisins–all built upon a notable undercurrent of roasted cane sugars. Taste: Eighteen years of aging and expert blending come to life with the first taste, revealing a deep vanilla flavor, followed by dried fruits, nutmeg, cinnamon spices and a hint of oak. Finish: Immensely smooth all the way through, this rum unwinds with a gently wavering sensation of oak, sherry and raisin. 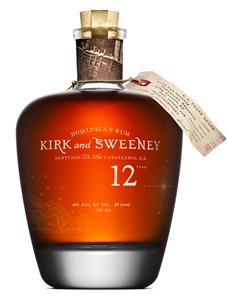 A 12-year-old rum crafted in the Dominican Republic from sugarcane, then aged for 12 years in American oak barrels. Aroma: This deep mahogany colored rum presents a sweet aroma balanced heavily toward cane honey, with earthy sugar cane undertones, along with a hint of vanilla, luscious toasted oak, caramel and dried fruits. Taste: Initial taste reveals a nectar-sweet quality, leading to a weightier body that indicates substantially aged rum that’s serious in character but not overbearing. Light notes of vanilla and wood hit the palate transforming into an incredibly smooth offering. Finish: Bold, ripe, and sweet vanilla flavors evolve near the end, providing a smooth, long and luxurious finish.